That first million has an important historical significance worth remembering. I’ll explain. I’ve been fascinated by Harriet Tubman for some time, and several years ago had the chance to do some research and writing on her life. Her story is quite interesting. Harriet Tubman was born as Araminta Ross in the early 1820s. Christianity was an important force in her life from her childhood. In her early 20s, she married John Tubman. She began to go by her mother’s first name and her husband’s last name, and thus came to be known as Harriet Tubman. When her owner died in 1849, his will set Harriet free. Unfortunately, in addition to his will, he also left behind outstanding debts. Realizing that she would likely be sold to settle those debts, Harriet chose instead to escape. Over the next 20 years, Harriet became an unstoppable force. According to some estimates, Harriet helped more than 300 people reach freedom. That record made her the most successful liberator in the United States and eventually earned her comparisons to Moses. She gained a reputation as a powerful speaker on behalf of abolition. During the Civil War, she served as a scout and spy for the Union. After the death of John Tubman, Harriet married a former slave and Civil War veteran Nelson Davis. She then shifted her focus to advocating for women’s suffrage. She also created a home to care for the aging and in particular for those who had nowhere else to go. In 1913, the liberator, speaker, spy, visionary, and scout died as a resident of the facility she had built. She left behind two biographies that she worked with a friend to complete and publish over the years. As someone who cared for the aging, who freed slaves, and spent her life fighting for equality, why does that first 50,000 matter so much? Because in the 1860s, Harriet was so notorious for her own escape and her role in freeing others that there was a bounty on her head. To be more accurate, there were many bounties on her head. The total value was somewhere around $40,000. But that $40,000 in 1860 would be worth significantly more today. By some estimates, it would be worth roughly $1,000,000. 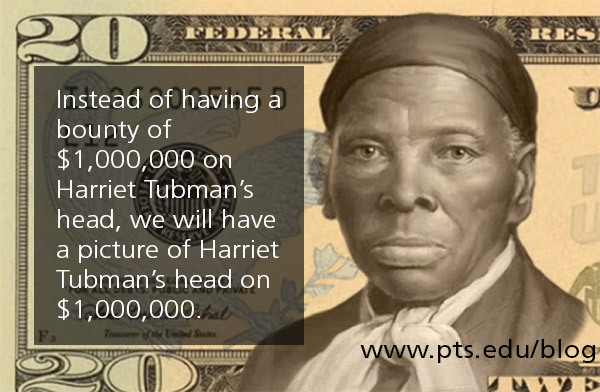 Harriet had a bounty of $1,000,000 on her head! By the time 50,000 $20 bills are in circulation, something fascinating will have occurred. Instead of having a bounty of $1,000,000 on Harriet Tubman’s head, we will have a picture of Harriet Tubman’s head on $1,000,000. I wonder what she would think about this. Some have pointed out that Harriet Tubman might be less than thrilled to have her face put on money. Her own life’s work was more concerned with real justice than poetic justice. Others have argued that this symbolism represents a significant moment in American history, one we should celebrate, not downplay. Maybe it doesn’t have to be an “either or”. Maybe this news can be both a reminder for us of the significance of Harriet’s legacy and call to each of us to work for what’s right. Either way, the moment that 50,000th bill is printed, something truly amazing will have happened. It will commemorate the legacy of Harriet Tubman—but whether it calls us to battle injustice, we’ll have to wait and see. The Rev. Derek Davenport ’05 is director of enrollment at Pittsburgh Theological Seminary and program co-director of the Miller Summer Youth Institute. Derek is also a PTS alumnus of the Master of Divinity (MDiv) Program after which he served at a church in Orlando, Fla., for five years. Besides working with prospective students, he serves as a guest preacher in Western Pennsylvania, researches church symbolism on his website, and tweets at @DerekRDavenport. You are apparently another one of those seditious types ! If not; please offer your explanation why you are okay with DEFACING the Money of MY COUNTRY !